The previews on the VHS tape for the screwball Canadian farce “Friends, Lovers & Lunatics” (which can also be screened in its entirety on YouTube, under the alternate title “Crazy Horse”) are far more amusing than anything in the movie itself. Not least because one of the previews is for “Friends, Lovers & Lunatics”! Now that’s a first! Other previews: just before the fall of the Iron Curtain came the release of a dark comedy called “A Forgotten Tune for the Flute” (also not on Netflix, so you can be sure I’ll be covering that one soon), of which the San Francisco Chronicle raved, “It’s a sign that the Soviet Union is finally loosening up.” And finally, the “Now on Videocassette” section peddles an $89.95 copy of the schlocky horror film “Phantom of the Mall: Eric’s Revenge” (which is on Netflix, for the price–if you’re a member–of roughly a dollar). Now on to the actual movie. One gets the immediate impression that director Stephen Withrow allowed his star–the already unhinged, frequently hysterical character actor Daniel Stern–complete freedom, which is the first of several fatal flaws. He’s some sort of artist–we know this because he wears red Ray-Bans at the office–and on the same day he gets fired he also discovers that his brittle wife (Sheila McCarthy) is leaving him for a stuffy professor (a bland actor not worth mentioning by name). Many a mediocre movie has at least served the purpose of making the audience side with a loony loser. In a movie like this, you want him killed. Instantly. Stern buys a gun. He stalks the professor while he’s buying McCarthy an engagement ring. He walks into the jewelry store and points the gun at him–but don’t worry, he’s only kidding, you see. The jewelry store owner tells Stern to fire the gun. (The entire film–when it’s not stalling for time–plays out in this inept, would-be-quirky vein). The rest of the movie involves Stern’s following the newly engaged couple to a countryside cabin; his slaphappy mix-up with a beautiful motorbiker (the sassy Deborah Foreman, who sadly disappears from the flick after something like 11 minutes of screen time); and a further mix-up with Foreman’s mean, dumb, thuggish ex (Page Fletcher), from whom she stole the motorbike, and his just plain dumb sidekick (a young Elias Koteas, who fares comparatively well here). These clowns think that Foreman is sleeping with the professor (don’t ask) and they hold him and McCarthy hostage in the cabin as they (and we) wait for Foreman to show up (to no avail). Stern also more or less disappears from the picture. Jokes disappear from the picture. The whole thing is mean-spirited and flabby, like an oversalted, sunken souffle. Withrow, who mostly edited for television and is now head editor at Toronto’s OutPost Media, gave me some brief recollections over e-mail on the making of his sole feature film. “Anything else I say could be hurtful,” he added. 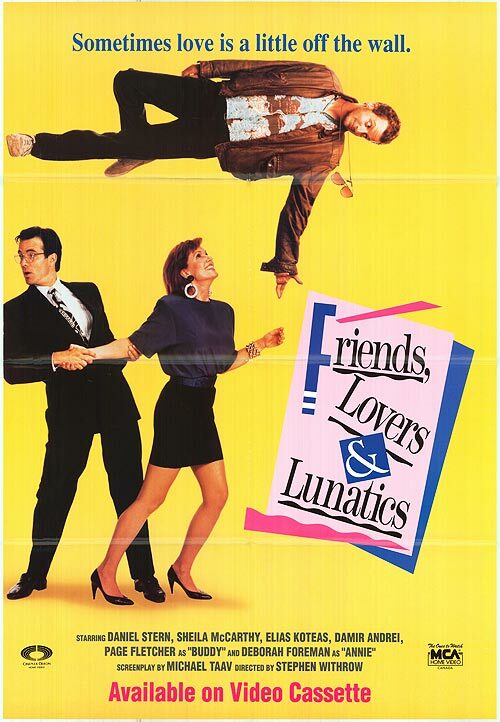 “Friends, Lovers & Lunatics” received a very limited run in Los Angeles and select other cities in November 1989. I hate it when VHS trailers include the movie I am about to watch, cause it makes me feel cheated out of a preview.